Tourism management is increasingly coming under fire from anthropologists concerned about issues of social representation and accelerated cultural change. However, when managed well and at a local level, it can represent an economic boon to the community and may even revitalize ethnic pride. This is not to say that tourism development of archaeological sites should proceed without expert consultation. Rather, using Taíno caves in the Dominican Republic as a case study, this paper proposes a methodology of archaeotourism where the anthropologist and archaeologist are positioned as "guides on the side" coaching local development of data collection techniques that can be used to craft and disseminate a narrative that is situated in local worldviews. Key words: Archaeotourism, partnership, situated knowledge, Taíno. La gestión del turismo es cada vez más criticada por antropólogos interesados en temas relacionados con fenómenos de representación social y cambio cultural acelerado. No obstante, cuando se maneja bien a nivel local, el turismo puede representar una ventaja económica para la comunidad e incluso puede revitalizar cierto orgullo étnico. Esto no significa que desarrollar turismo a partir de sitios arqueológicos deba realizarse sin consulta a expertos. A partir del estudio de caso de las cuevas Taíno, en República Dominicana, se propone una metodología de arqueoturismo en la cual antropólogos y arqueólogos actúan como "guías" para entrenar a las personas en el desarrollo de técnicas de recopilación de datos que pueden utilizarse en la elaboración y difusión de una narrativa emanada de las cosmovisiones locales. Palabras claves: arqueoturismo, cooperativismo, conocimiento contextualizado, Taíno. Tourism is often seen as a panacea for communities that are rich in cultural heritage, but poor in economic resources. Tourism can be a valuable development strategy, bringing increased employment opportunities, improved infrastructure, and a windfall of money from outside the community. Tourism may also valorize local cultural traditions in the process (see Comaroff and Comaroff 2009); however, all too often the profits from tourism initiatives bypass the local community and flow directly into the pockets of stakeholders in national centers or foreign countries. And, as if that were not insulting enough, tourism also tends to disrupt traditional beliefs and practices as locals become objectified by the tourists’ gaze (see Pickard and Wood 1997). Tourism initiatives also run the risk of freezing local culture into an idealized ethnographic present. As scholars invested in the belief that representation and development efforts should be handled by and for locals, we support a model of tourism development that is locally conceived, implemented, and assessed. However, as we will show with the case of Cueva Borbón and Cueva de las Maravillas in the Dominican Republic, without expert consultation, local initiatives can be incredibly destructive to the environment and cultural heritage. In light of our complementary desires to empower the local community while simultaneously passing along to them methods of conservation and preservation, this paper presents a potential solution to working with local stakeholders to retrieve a cultural heritage site from the deleterious effects of uninformed top-down tourism initiatives. In this paper we begin our exploration of a collaborative archaeotourism methodology with a review of the benefits of locally directed tourism initiatives, showing that these initiatives have had great success in promoting self-efficacy in a wide variety of geographic regions, which makes success in the Dominican Republic as well as other parts of Latin America very likely. By archaeotourism we mean the visitation of archaeological sites as part of one’s tourist activities. As such, it lies at the intersection of heritage preservation and cultural tourism, which is capturing an ever-increasing share of tourist dollars (Wurz and van der Merwe 2005). The increasing popularity of archaeotourism means that underdeveloped archaeological sites may be at risk from tourism entrepreneurs who lack conservation skills (Wurz and ven der Merwe 2005:12). Having established the theoretical context for our discussion, we then turn our focus to the case of two similar tourism development initiatives in two caves in the Dominican Republic. The development projects in these two caves were handled by governmental agencies of the Dominican Republic. Unfortunately these efforts lacked both widespread community buy-in and guidance from experts who would, presumably, have advised the project supervisors in best practices for ecological and heritage preservation. Lastly, as we have been asked by government officials to provide an alternative plan for the tourism management of Cueva Borbón, we suggest an approach that would simultaneously encourage local people to reclaim the cave as an identity-building project. The outcomes of heritage tourism are largely a matter of how well initiatives are handled (Pinter 2003), and rely in large part on the design of the project and involvement of key stakeholders. To begin with, the local community may or may not have a deep-seeded investment in the preservation of their heritage. In many developing countries, the majority of destruction caused to heritage sites is by locals due to "indifference, ignorance, or commercial avarice" (Crosby 2002:365). We do not wish to give the impression that people in such countries are indifferent or ignorant; rather, we recognize that in many circumstances, economic concerns take priority over academic pursuits. In such a scenario, educating local people about the value of archaeological material is important (Crosby 2002:365), but education alone will be to little effect if they do not feel the benefits at a personal level. Some of these benefits may, and should, be financial when tourists pay to visit the sites. However, there are also nonmonetary benefits to be gained including an increased sense of self-efficacy and empowerment. Like any applied anthropology project, developing a site for archaeotourism should take into consideration the needs of the local community and the effects our work has on that community (Pyburn 2009; Pyburn and Wilk 1995). The observations and recommendations in this section constitute a set of best practices for ensuring that the power of representation remains with the local community throughout the processes of excavation, display, and archaeotourism development. Museum exhibits have the power to legitimize culture (Hoobler 2006), a power that should be considered carefully by archaeologists and anthropologists who may be involved in preparing artifacts or ethnographic details for display and consumption in such settings. This power extends to cultural and heritage tourism sites as well (see Comaroff and Comaroff 2009). If outsiders, foreigners or even cosmopolitan elites in other parts of the country produce these representations, local people can feel alienated from their own history. If these representations are produced by insiders, on the other hand, it gives local people a chance to gain recognition for elements of their culture that are most deeply valued. Even knowing that all insiders do not have a homogenous perspective, we argue that foregrounding local voices will moderate the potentially alienating effects of commodifying culture. Putting the power for decision-making back in the hands of people whose ancestors once owned the land is a powerful statement about authority and the right to represent oneself (see Pavlovich 2003). When they are denied this power and authority, "the heritage they believe so inalienable takes on a representation beyond their control and limits them in their ability to participate in an idea they believe uniquely their own" (Porter and Salazar 2005:363). Yet in the case described here, the link between present-day residents and ancestral use of the site is not fully understood, and potentially tenuous at best, which complicates their sense of connection to the site. 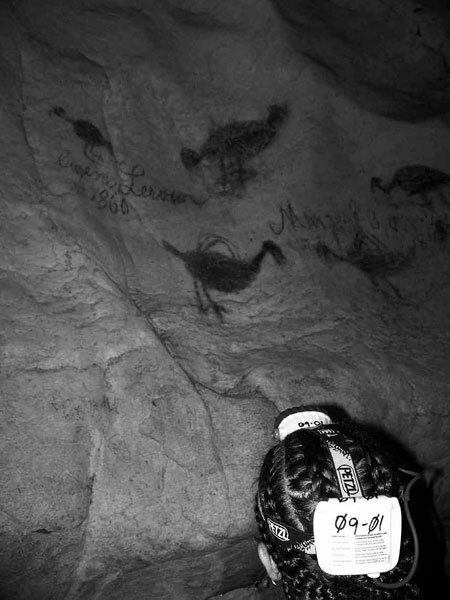 Nonetheless, we agree with Janette Deacon when she writes that "it is vital to consult descendent communities even if the direct connections between these individuals and the rock art is vague" (Deacon 2006:397). If an ethnic group has become assimilated to the point that most outsiders, and even some insiders, no longer consider those individuals distinct from the majority population, tourism initiatives can be one component of a larger project in reconceptualizing or "inventing" their ethnicity. For example, in Marjorie Esman’s study of Cajuns in Louisiana (1984), she demonstrated that mostly or fully acculturated ethnic minorities can market their culture as an attraction to both foreign and domestic tourists without disrupting local culture or paralyzing their modernization. This may be important for the people of the Dominican Republic as assimilation has been so complete in this post-contact era that many individuals feel only a distant connection with Taíno ethnic heritage. One way for us to think about ethnicity, particularly for ethnic groups that seem to be more or less indistinguishable from the dominant society, is in terms of interest groups that serve "as a means of mobilizing a certain population behind issues relating to its socioeconomic position in the larger society" (Conzen et al. 1992:4). Kathleen Conzen and colleagues define ethnicity as "a process of construction or invention which incorporates, adapts, and amplifies preexisting communal solidarities, cultural attributes, and historical memories" (Conzen et al.1992:4-5). While they do not wish to go as far as Werner Sollors in claiming that ethnicity is a "collective fiction", they do agree with him that it is a social construct, one that arises out of very specific lived experiences (see Sollors 1989). Conzen et al. (1992) recognize that ethnicity as a social construct emerges from the interactions of a specified collective and the dominant society from which they feel themselves to be separate. We would like to suggest that archaeologists and anthropologists are another important group that may, intentionally or unintentionally, contribute to the invention of ethnicity. The results of any future data collection may greatly inform (re)inventions of ethnicity among the Taíno, which is why we stress the inclusion of a diverse set of local voices in any future deveolpment of Cueva Borbón as a tourist destination. From 2001 to 2004, the Ministry of the Environment of the Dominican Republic approved a tourism development program that covered two large cave sites containing Taíno rock art: Cueva de las Maravillas and Cueva Borbón (figure 1). However, this development project was spearheaded and directed by the Department of Speleology. This group’s work in both cave systems was publicly criticized by the Cuba Speleological Society (2005) for proceeding in their development efforts without first conducting a thorough conservation study, which had been requested by the Speleological Federation of Latin America and the Caribbean. As Cueva de las Maravillas was the first of the two cave sites developed for tourism under the program, the story of Cueva Borbón cannot be told without first relating the tale of the development of Cueva de las Maravillas. Cueva de las Maravillas in the Dominican Republic is of particular concern because it is not only a contested heritage site, but because the infrastructure being built to facilitate tourist use of the site is threatening its scientific value for archaeological and ecological research. Cueva de las Maravillas was discovered in AD 1926, and the artwork consists of over 500 individual works of art, including some petroglyphs but primarily pictographs executed in black or red paint (Stevens-Arroyo 1988). The sheer numbers comprising the corpus of rock art in Cueva de las Maravillas makes it one of the more important Taíno cave sites in the Dominican Republic. This is of pressing importance because of the paucity of data we have on the Taíno (Deagan 2004)1. Figure 1. Map of the Dominican Republic with the cave sites mentioned in text. 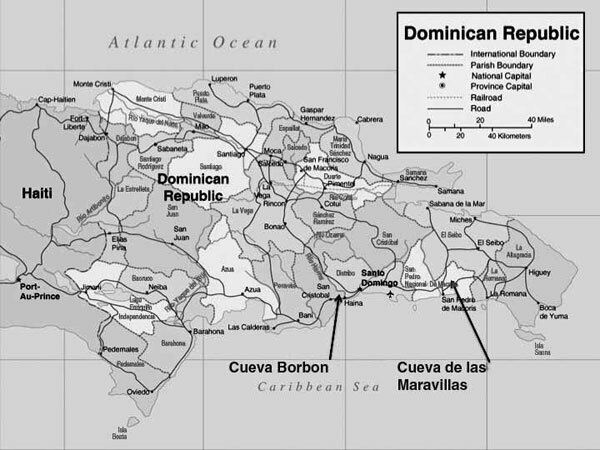 Mapa de la República Dominicana con las cuevas mencionadas en el texto. This cave is of immense historical significance and had the cultural material been evaluated in situ, it might have revealed something about the life ways of the people who used it in antiquity, but out of context, much of this material is rendered meaningless (Maggiolo 2007). This is particularly contentious because as part of the nation’s cultural patrimony, the Borbón cave system as well as the Cueva de las Maravillas are legally protected from alterations that would disrupt cultural or ecological materials (Espinal Hernández 2005). In the interest of making this site accessible to tourists, some human remains were removed, but without consultation with experts (Mejía 2005b). This set off a chain of events that has not only threatened the cultural patrimony, but has also adversely affected the flora and fauna. While one of the individuals responsible for overseeing the work done in the cave claims that it was done with great care and expertise, others maintain that the proper government officials were not consulted regarding the transformation of this site (Mejía 2005b). The Caribbean International Association of Archaeology condemned the treatment of archaeological material in both the Cueva de las Maravillas and Cueva Borbón because they were neither studied nor stored according to disciplinary standards, significantly limiting our potential to learn from them (Mejía 2005a). Aside from the loss to the historical record, this treatment may interfere with the site’s qualifications for UNESCO recognition (Mejía 2005a). The development efforts in Cueva de las Maravillas were lauded by some and clearly condemned by others. It is not surprising that one of the primary objections of the individuals opposed to the development program is that there were no archaeologists or rock art specialists involved in the development process. However, the protestations by critics did not gain much traction and the cave opened for business. The tourism development initiative that began in Cueva de las Maravillas during 2001 involved several actions that irrevocably changed the nature of the cave environment. The development team hired a team of laborers to install an extensive system of cement walkways and staircases, using jackhammers to level cave floors and widen areas to facilitate the walkways. Following this, in this same year, geologist Rickard Toomey and linguist Elizabeth Winkler were brought to the site as external consultants for their expertise in caves. 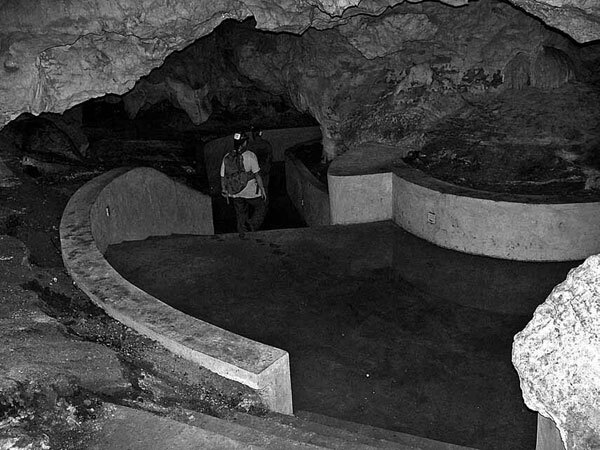 While acknowledging that cement walkways like the one installed in Cueva de las Maravillas are present in a few tourist caves in the U.S.A., they nonetheless argued that cement walkways inside the cave were not ideal because, should the intended use of the cave shift away from tourism, they could not be removed as easily as other possible constructions (Toomey and Winkler 2005). The development team also installed an electric lighting system that consisted of small runner lights within the walls of the cement walkway, as well as floodlights to illuminate large cave chambers and Taíno pictographs. In the report based on their 2001 visit, Toomey and Winkler present a number of suggestions for minimizing artificial lighting and the resultant potential for algae growth, though overall they credit the ministry with developing a satisfactory approach to lighting the Cueva de las Maravillas. From our perspective, the most negative consequence of over-lighting that Toomey and Winkler (2005) mention is the potential for damage to pictographs and speloethems. Other modifications to the cave environment include the creation of an artificial lake, stream, and reflecting pool that are all interconnected throughout one of the larger cave chambers. A number of skylights were installed in sinkhole entrances to the cave system as well as a marble floor below one of these skylights. An elevator was also installed in the cave ostensibly to facilitate access to the site, although the primary access to the cave is through an entrance that can be reached in a 10-minute walk. While the development program for Cueva de las Maravillas is certainly impressive in scope, a series of problems was revealed as the project progressed. The issues are numerous, but one of the most problematic is that no-one involved in the team conducting the development had any formal training in archaeology or rock art studies. Furthermore, none of the matrix that was removed throughout the cave to make way for the cement walkways was screened or otherwise examined archaeologically. It was argued by the development team that due to the fact that some archaeology had been conducted in the cave in the 1970s, and that there were subsequent guano mining endeavors in the cave, that there was no need for any further archaeological work in the cave. In their report, Toomey and Winkler (2005) made note of the extensive damage done to the cave floor by guano mining as well as unauthorized visitation to the cave. Because the natural cave environment was already so damaged, they concluded that additional construction would not significantly add to the present level of destruction. Toomey and Winkler report that the laborers themselves were responsible for an unnecessary level of destruction in Cueva de las Maravillas (2005). The laborers were often left in the cave unsupervised, and some of them started breaking speleothems in order to remove them from the cave to sell. They also decided to increase the total amount of rock art in the cave by producing their own engravings in certain areas. And while largely unintentional, the dust from the use of jackhammers in the caves was tremendous, and it began coating the artwork in the cave. The work crew devised a solution to this problem: they covered many of the pictographs with plastic sheeting. This essentially created a miniature greenhouse over each pictograph with potentially damaging condensation. The unintended degradation caused by covering the artwork with plastic was one of the primary concerns expressed in Toomey and Winkler’s (2005) report. The Borbón cave system has received less international attention, but has been subjected to much of the same treatment as the Cueva de las Maravillas. The Borbón cave system was first reported by Sir Robert Schomburgk in AD 1852 as a part of an effort by the Ethnological Society of London (Schomburgk 1854). Of this system with more than 50 caves, at least 20 of them contain rock art and archaeological evidence of human use (Atiles 2005). All told, this cave system contains over 3,000 works of Taíno cave art. These caves feature petroglyphs consisting of anthropomorphic faces, some of which also have headdresses (Atiles 2005). Pictographs in the cave often feature mural scenes (Atiles 2005), some of which may be associated with hallucinogenic drug use and religious ritual (Nieves-Rivera et al. 1995:129). Since the tourism efforts began, the main cave in the system (cave number one) is now typically referred to simply as Cueva Borbón (figure 2). Soon after Cueva de las Maravillas opened for tourism a similar development plan was initiated for Cueva Borbón. Cement walkways and staircases were installed by another team of laborers who dug out pathways in the cave and employed the use of jackhammers in the process (figure 3). An electric lighting system was installed, and the cave was nearly ready to open for tourism. Figure 2. Cave paintings in Borbón Cave. Pinturas rupestres en la Cueva Borbón. Figure 3. A walkway and staircase in Borbón Cave. Una pasarela y una escalera en la Cueva Borbón. By the time the last phase of the development project in Borbón was nearing completion, the news of what had taken place in Cueva de las Maravillas had spread, and the concern over the methods that were employed had grown. Some concerned individuals opposed to the construction activities in both Cueva de las Maravillas and Cueva Borbón managed to sneak into the cave and photographed human remains that had been disturbed by the construction, and charged that the skeletal material was not being handled in a professional archaeological manner. They released the photos to the public and ICOMOS, the International Council on Monuments and Sites, and as a result a critical mass of negative sentiment finally resonated with the powers that be. The development program was then terminated, and the cave has never opened for tourism. Our proposed approach to Cueva Borbón can be seen as a methodological experiment to be tested, refined, and eventually used in similar situations that put anthropologists and archaeologists in the position of reclaiming a top-down initiative for reinvention as a grassroots identity-building project. During the summer of 2009, Juan Rodriguez, the director of the Museum of Man, and Cameron Griffith met to discuss ideas for the future of cave archaeology and tourism in the Dominican Republic. After a few weeks of visiting cave sites and discussing various approaches based on Griffith’s experience with cave tourism development in Belize, Rodriguez indicated that the Ministry of Environment had requested that Griffith work together with them and the Museum of Man to come up with a new plan for tourism in Cueva Borbón. Successful management of archaeotourism depends upon the various invested parties developing a shared understanding of what is at stake and how goals will be met (Deacon 2006:380). It is particularly important that local residents be included in these discussions, regardless of the genealogical connection they have with the original occupants of the site. When the local people do not retain the right to develop their own interests for the tourist market, and are instead subjected to top-down initiatives, their communities are likely to suffer (Mitchell and Reid 2001). As Joe Watkins writes, "[m]any archaeologists continue to operate as if the body of science operating within the political structure of the dominant government is a harmless entity to nondominant groups" (Watkins 2005:432). We recognize that all knowledge is situated in particular social and historical contexts (Brown et al. 1996) and that our interpretations of the past, and indeed our very approach to the past, may be at odds with those of the people we seek to represent. In light of this, we seek to be "travelers" capable of moving between situated knowledges (Damarin 1996). But to do so will require the help of native ethnographers who can scaffold our acquisition of locally situated knowledge of heritage. We need to know more about the local people, their interest in and possible use of the caves, and what they want to get out of the cave tourism initiative. Though interviews and focus groups would no doubt be useful tools as we seek to learn more about the local community, the ultimate goal would be training local individuals as ethnographers and archaeologists who would produce and circulate their own narratives about the past. The goal of providing them with these disciplinary tools is not to recruit them into academia, but rather to provide them with a framework that can be used to systematically gather data about the area’s past. This is particularly important since the local population’s geneological link with the Taíno is tenuous at best and, therefore, Taíno folklore regarding the caves has likely not been preserved. The locals’ ethnographically and archaeologically informed narratives then would form the basis of tour guide scripts, educational materials at the site, and promotional materials produced for tourists. Our role in this would be one of educators, teaching what we know about data collection methods, but also being open to innovations that fit the local context. We would also be students, learning from them what they felt to be the most important features of Taíno culture worth presentation. Finally, we might serve as native ethnographers of a different sort. As Americans familiar with the desires of American tourists, we would be in a position to provide local developers with feedback on the needs and desires of the tourists who will eventually visit their sites. By rotating these roles, all parties involved have a chance to bring their expertise to the project without becoming oppressive to any other group involved. Our position as Western academics also bring with it the possibility of financial resources and students who could serve in archaeological or ethnographic capacities under the guidance of local project leaders. In addition to having a voice in how the tourist site is structured, we would also encourage local stakeholders to play an active role in presenting their own heritage via community museums. In Oaxaca, "[c]ommunity museums have proved to be a way for the towns to construct and transmit their identities through the choice of themes important to the communities" (Hoobler 2006:443). When visitors respond positively to the items community members have chosen to highlight, those aspects of their culture, rather than those deemed important by colonial powers or national centers, are validated (Hoobler 2006:444). Taking back the power to represent themselves is one aspect of the decolonization mission (Hoobler 2006). Though we are aware of the dangers of tourism from the perspective of the local population, we feel that our proposed plan could be an effective strategy for this area of the Dominican Republic, particularly because this community could use cultural heritage as one way to distinguish their site from others that fall under the "sun, sea and surf" designation within the Caribbean region (Crosby 2002:268). To reap the most positive benefits of tourism as a development strategy, power of representation must be retained by the local people. Giving them the tools to build their own heritage narratives will result in greater self-efficacy and has the potential to revitalize an ethnic heritage that has become dormant in the face of widespread assimilation. Empowering the local community to be responsible for their own representation in archaeological museums may also have the side benefit of greater compliance with official rules and regulations, such as reporting finds, because the people are less concerned about their heritage being usurped by outsiders (Hoobler 2006:451). It is our hope that encouraging local people to become more invested in protecting and promoting their own heritage will prevent further abuses of cultural patrimony like what happened in the Cueva de las Maravillas and Cueva Borbón. We are conscious of the paternalistic implications of seeking to empower others, which is why we approach this role as one of "guide on the side" who coaches rather than instructs, engaging as equals with locals with the intent of removing ourselves from the project as soon as possible. This runs counter to typical practice in academic archaeology and may even result in unorthodox interpretations of the past that better reflect the local worldview (Crosby 2002:376). As Andrew Crosby has noted, "[t]here is a difference between archaeology that involves local communities and archaeology that is commissioned by and for the community" (Crosby 2002:363). While we cannot do the latter because the cave has already been altered by a top-down governmental initiative, we can use community based methods and seek the advice of native ethnographers to responsibly advice all parties involved in reclaiming this heritage site and promoting it to the public, including tourists. And while we will seek to remove ourselves from the initiative as soon as possible, we will use what power we have as Western academics to amplify the local stakeholders’ voices. Acknowledgements: We are extremely grateful to all those who helped us begin this process: Juan Rodriguez for inspiring these ideas and for his friendship, Geoff Conrad for his continued support of these endeavors, Gina Zavala Quistiano for her enthusiasm for and dedication to cave archaeology, Domingo Abreu Collado for taking C. Griffith on his initial visit to Cueva Borbón, and Alejandra Figueroa Flores for her assistance with Spanish translations. We would also like to thank the reviewers of this manuscript for prompting our continued thought on the issues discussed above. * Artículo seleccionado del conjunto de ponencias presentadas en el Simposio Shifting from Object-centered Research to People focused Application: Current Approaches to Public Archaeology from Latin America and the Caribbean, realizado en el marco de la 75 reunión anual de la Sociedad de Arqueología Americana, Saint Louis, Missouri, EUA, abril 2010. 1 Many archaeologists have bought into the assumption possibility that scholars have misread the archaeological that Taíno society declined so rapidly following initial record in this area and should expand their data collection contact with Europeans, that there was little to be gained techniques for more minute signs of indigenous interaction in studying this region; however, Deagan (2004) raises the with Europeans. Picard, M. and R.E. Wood 1997. Tourism, Ethnicity and the State in Asian and Pacific Societies. University of Hawai’i Press, Honolulu. Recibido: octubre 2010. Aceptado: junio 2012.